To reach this cemetery from Florence, Alabama, travel west on Alabama Highway 20 for 19 ½ miles. Turn right (east) onto County Rd. 8 and go .6 mile. Turn left (north) onto County Rd. 116 and go 1.1 miles to the cemetery on the right side of the road. This cemetery is located in northwestern Lauderdale County, Alabama. It is neat and well cared for. 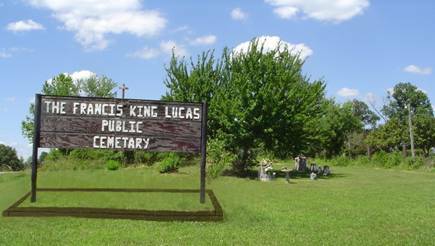 There appears to be approximately one acre of land for the cemetery with plenty of room left. As the name implies, it is a public cemetery with no restrictions on who may be buried here. McWaters, Jimmy Travis; b. 30 Apr 1937, d. 04 Feb 1997, husband of Duby L.